For the last 3 days I have been involved in a workshop called Digital Citizenship in the PYP. My workshop facilitator was Nathan Pope (@Chinaheadk12), he was great at catering for a diverse group of learners and was very open to sharing resources and his presentation with us. 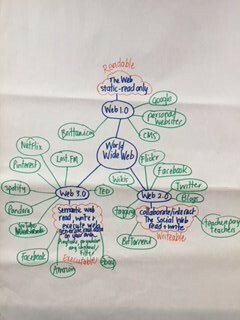 I learnt some new things about Digital Citizenship and many discussions reaffirmed some of my prior knowledge and allowed me to share content with the group. So what is Digital Citizenship? This image is a brainstorm chart of my group’s definition of Digital Citizenship. It says: Being a digital citizen means having an awareness of how to be safe and responsible in the digital community. We also wanted to acknowledge a level of accountability for individuals. My previous post (2 days ago) was a response to one of our workshop readings, which stimulated great discussion within our group about the use of technology in the classroom. This post is an overview of the course and the highlights for myself as a learner. 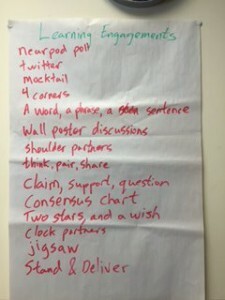 Some old and new Learning Engagement strategies, I particularly loved the Nearpod poll, (http://nearpod.com/) this allowed you to see results being generated from the class live. Nearpod is a tool for delivering content that I would like to trial with my students. You can set it to class mode and run through it as a group or set it to individual mode where students can work through content and tasks at their own pace. Something worth exploring for sure. Web 1.0, 2.0 & 3.0 and learning what these were and the difference between each. I had never heard of this before but it was something I enjoyed learning about. Here is a brainstorm image from the workshop explaining this. In short Web 1.0 is readable content we can view but not edit, Web 2.0 is writeable content we can collaborate with others on and Web 3.o is executable, artificial intelligence, computers communicating with computers to share content relative to our interests. Pretty amazing stuff. Please also view the video link for a more detailed explanation below. Google a Day Challenge: http://www.agoogleaday.com/ I’m interested in using this with middle to upper primary students to assist them with searching tips using Google. There are some skills that need to be specifically taught and refining searches is one of them. Are we disconnecting by being digitally connected? I stumbled across this video whilst searching for something else but thought it was just too good not to share. It’s about the issues we have today about being connected by technology but disconnecting socially in real life. I think everybody should take the next 20 minutes and just watch this Ted Talk by Sherry Turkle, especially those addicted to their phones! We also explored Digital Footprints, Cyber Safety/ bullying, Grooming and Creative Commons and copyright issues (plagiarism). I have a bit of a background knowledge on these topics already but would like to add the videos I thought were quite good in relation to these topics. 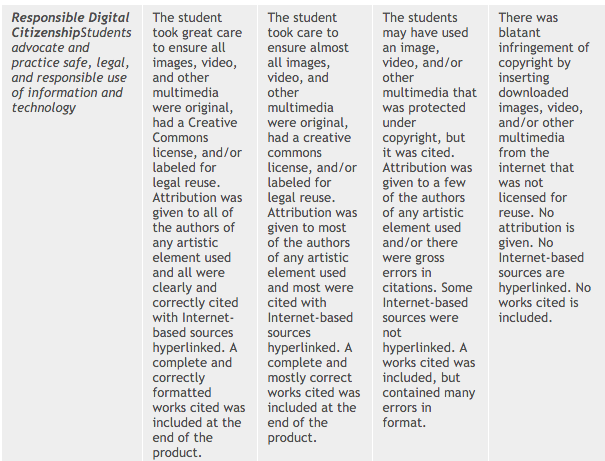 Digital Citizenship Rubric: We discussed the importance of intellectual property and plagiarism. We defined plagiarism:Plagiarism is the use and copy of unacknowledged works. Works can include pieces of art, music, theatre performances, graphic designs, photography, film, published/ written works online, website content, programmes, graphs and digital representations. We then discussed ways in which we could educate students about plagiarism and how to check if their work was cited properly. This rubric can be used or adapted to suit your students, I think it’s quite good. Finally Policy Documents: We had the opportunity to look at policy documents from other people’s schools in the group. The big take away point was that staff, students and parents should be involved in creating the policy documents. Too often it is the responsibility of a senior/ leadership staff member to create policy documents and then they share it, ask people to read it and then it’s done. Some people will take the time to read the policies but I dare say that more people will not find the time to engage with them… So, getting people involved in the policy drafting process and then handing the ideas over to leadership or senior staff to finalise is probably a better way to go about it. Final thought, we are all Digital Citizens, it is our responsibility to be great role models for our students and share our knowledge and understanding about what it means to be a good citizen, on and offline. Thanks for reading, please post a comment. I presented at staff meeting this evening about a course I’ve been on recently called Effective Teaching in English & Mathematics. The course has been designed by AISSA (Association of Independent Schools of SA) and delivered by Rosemary Kadow and Desiree Gilbert. Some of the references and resources have come from their course guide. The course runs for 3 days and I still have one more day left but thought I should reflect on my experiences so far and what I have shared with my colleagues. Our school has been focusing on curriculum alignment. We are an IB school so we have been focusing on aligning ACARA with IB, making our planning intentional and clear for all to assist with informing our assessments and reporting. The reflective tools were useful and I have enjoyed using them with my class and other staff seemed to appreciate more strategies to try out in class. Success Criteria. Our lessons should hold no secrets. Students should know what we aim to do, how they can achieve success and the purpose behind the task. This is all part of WALT (What Are Learning To), WILF (What I’m Looking For) & TIB (This Is Because). Shirley Clarke introduced the concepts of WALT, WILF & TIB, google her and images for each and you will find an abundance of resources. I will blog again about my final session and share some more strategies I have used in the classroom. Thanks, please leave a comment. This morning we had the ANZAC Day Assembly. Students of every age across the school campus Reception-Yr 7 all seemed to understand the significance or importance of showing respect during this time of reflection and remembrance. The stillness in assembly was something unlike any other day in your typical primary school. Following the assembly we returned to class and watched this clip on You Tube about the significance and symbol of the poppy. This helped students to understand why we make poppies on ANZAC and Remembrance Day. To do this in your class you will need the template, some red and green paper or card, scissors and glue sticks. 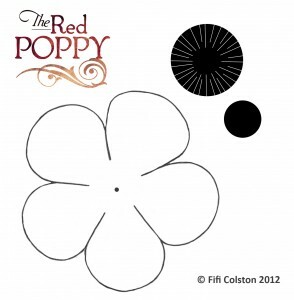 We have been looking at procedure writing in English so we also watched a video about how to make a poppy. This was quite handy. 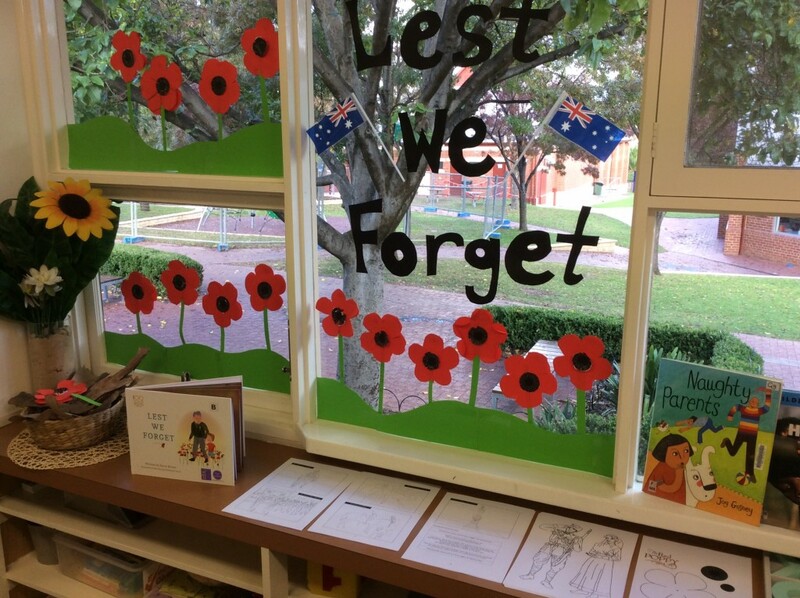 This is the final display in our classroom of our ANZAC poppies. Some children chose to look at and draw or colour in pages of ANZAC soldiers and nurses like this image below. After recess we returned to class and read a book about the ANZACS. I was fortunate to have a parent find and lend me this lovely book called “Lest We Forget” by Kerry Brown. We read in it class today to give the children some context as to why we say Lest We Forget and why it is a day that we choose to remember the ANZACS. It has beautiful illustrations and puts things into perspective for children. The link below takes you to a review of the text. Following the reading of the book there were many questions and discussions about the soldiers, nurses and animals in war. We reflected on the importance of acknowledging all those brave men and women who served Australia and fought for our freedom and rights today. We had a lovely day reflecting on the significance of ANZAC Day and many students were keen to attend ANZAC services tomorrow for the centenary. 2. An explanation of what the poem is about, in your opinion. Please submit the URL in the ‘my poem’ assignment on Edmodo. I chose to partake in this lesson and have found a poem and will submit this assignment. What do I say while the others laugh? I’m choked with emotion; words fail me. But the words are so sweet, so lovely. An “angel” is heckled for loving. So the others won’t act up, too. And the “angel” is not quite through. As I call the names left on the list. The writer is a teacher. The angel is one of her students. The student/ angel is a boy and he says he loves his teacher during roll call. Obviously this teacher has made an impact on this child. I have made the assumption that this is a young boy, a child in primary school. The other children laugh at him, obviously not many students announce their love for their teachers. This makes me wonder how old the children are, and if the boy is different in some way? Is this boy craving love from his teacher because he doesn’t get love at home? Or is this boy in a family who openly expresses their feelings and love for one another, that this appears to be a normal behaviour? Is this boy different from his peers? Yes. How and why? We do not know. The teacher appreciated this boy and his kind words but fears that his actions and words will isolate him. Yet she craves the words all the same. Teachers can love their students and students can love their teachers, but it is not something that is usually expressed for fear of judgement, limitations of standards of professionalism, keeping safe distances and boundaries within the classroom, defining an appropriate teacher/ student relationship etc etc. A lovely poem all the same. An experience I can relate to. Embedding a Cyber Smart program into the curriculum. Provide students with the information on safe use of social media. Provide students with the curriculum that identifies key online risks and issues. How do we embed Cyber Safety within current programs in the curriculum? There is no doubt that we, as educators see the importance of raising student awareness about issues regarding online safety. There are constant changes, risks and obstacles we face online and it is our responsibility to equip our students with the tools and strategies to safely engage with the online world. In my teaching experience I have created a Digital Citizenship Unit of Inquiry with my Year 6 students to address such issues. I found this statistic fascinating: The average number of student personal digital devices is 4 or more each! This includes devices such as iPad’s, phones, laptops, gaming consoles, iPods etc. It was also interesting to note that whilst the number of mobile phones for students hasn’t really changed, they have instead progressed from standard mobile phones to Smart Phones, allowing further access to online activities. Less than 5% of Primary Schools students are on Facebook. There has been a shift away from Facebook and a move towards other social networking sites and apps such as Instagram and Kik. This is due to Facebook becoming an increasingly adult world where students are being friended by their parents, family members etc. We need to remind our students about the security settings within each app and site. For example many students are using Instagram to upload their personal pics, not realising that even though they are sharing these pictures with their friends lists, the pictures themselves become property of Google images and can be used on Google and found by strangers if searched. I have students in Year 6 who are currently using Instagram and I wonder if they realise this…note to self: remind my class about this in our next Digital Citizenship lesson. KIK: Kik has limited security settings, it is meant for young adults (17+), we find many offenders on this app, searching for young people. Do not recommend KIK to students, talk about the lack of safety and how to change the settings to not allow strangers to connect with you. YouTube (13+): So many students have YouTube accounts and upload videos of themselves to share with others. Again there are privacy settings and choices of who you share your videos with. Golden rule of if you wouldn’t share this with your grandma, don’t share it online. Vine (17+) (6 second videos) Risky behaviours are being displayed here, students dare each other to do things to get their 6 seconds of fame online. 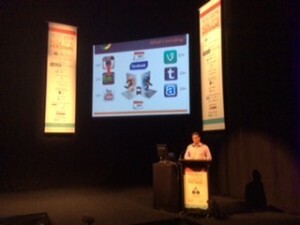 We need to warn students about these risky behaviours and what impact 6 seconds can have on your digital reputation. askFM (13+) ask.com has recently purchased this site and have promised to clean the site up and restructure it. It is not one to recommend to children. Whisper. This site has been linked to teenage suicides, it allows people to comment and be completely anonymous, which is why students like it, but also allows for some terrible posting and behaviours. SnapChat: This app is being used by some of my students. The idea is that students can share a photo and set a time limit for that photo and then it “disappears”. The issue is that these images are being shared but then captured and stored and shared again! There are Snap Chat cheats to collect the images without the sender realising their photo has been captured. The names of the cheats are: Snap Save, Snap-Hack Pro, Snap Capture. I wonder if my students are aware of this??? It is so important for us to create an awareness of the importance of Security Settings. We need to not only tell students to change their settings but also show them where they are and how to activate them. Sometimes it is simply one setting that can take you from high risk to low risk. We need to develop the idea of Digital Identities and how they are your real identity too. Teaching the whole person and developing their well-being. Cyber safety is viewed negatively in the eyes of students, there is the “been there done that” mentality. 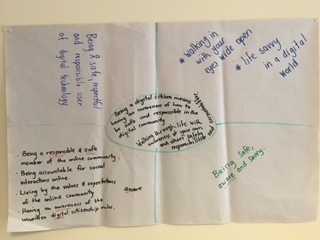 However, the Digital Citizenship topic is seen in a positive light, looking at who you are as a person online and the values and behaviours you display that project who you are as a person. This website gives examples of websites that are full of completely false facts. They are quite clever but can be used to teach students how to identify good sources of information. Check them out. As part of my PLP (Personal Learning Plan) I identified the need for me to focus on Mathematics, specifically Maths mental warm ups and Maths lesson starters. I did a warm up for a lesson today which I thought was quite good and I thought I would share and document it. Warm up Activity: Revisiting Properties of Shapes. You were given a 3D solid shape in class today. You need to describe the properties of that shape on your iPad (using the apps Explain Everything OR Educreations) and post your video to the padlet attached. PS. Remember to use the vocabulary we learnt in the last lesson. Key words I’m looking for are vertex/vertices, edges, faces, angles. The thing I liked about this activity was I was able to quickly collect my students responses and view them later in my own time. I was then able to assess their work whilst the students were off at another lesson. I was able to give them direct specific feedback about the content of their videos and assess if they were capable of listing the properties of a 3D solid shape using learnt vocabulary from the previous lesson. The students seemed to enjoy the task too as it was recapping what was learnt in the last lesson and applying some of their creative skills to communicate their learning in a different way. It was a fun Maths Warm up today and I’m glad it went so well. The teaching of mathematics is a complex business, and in the busyness of school life, teachers often do not have time to reflect on the teaching and learning cycle, on what is working well and on what could be improved. Additionally, many teachers have expressed a lack of confidence in their own mathematical knowledge, which in turn impacts on their teaching of mathematics. The interplay between school mathematics and the development of numeracy is complex. MLATS core course offers a broad introduction to the teaching and learning of mathematics and numeracy, and seeks to help participating teachers identify the mathematical knowledge that students should be learning, and makes explicit the teacher’s role in supporting all students to be successful. Our broad range of other workshops and short courses are designed to meet the needs and interests of teachers. We need to report to the achievement standards in ACARA and be mindful of IB curriculum too. Thought: Being confused means that you are learning. (I shared this with my students and they were so surprised and relieved!) This was one of my highlights. I don’t need the answer I want the process. Students need to construct meaning for themselves. Students need the factual and procedural knowledge but they also need to know when to apply these in everyday problem solving tasks. I am concerned with students whom I have worked with who have difficulty with number concepts and Sarah (Course leader) suggested that they might have dyscalculia. I had not heard of this term so did some brief research about it. Here is what I found. Formative assessment: A discussion about how we assess mathematics formally came up in this session. 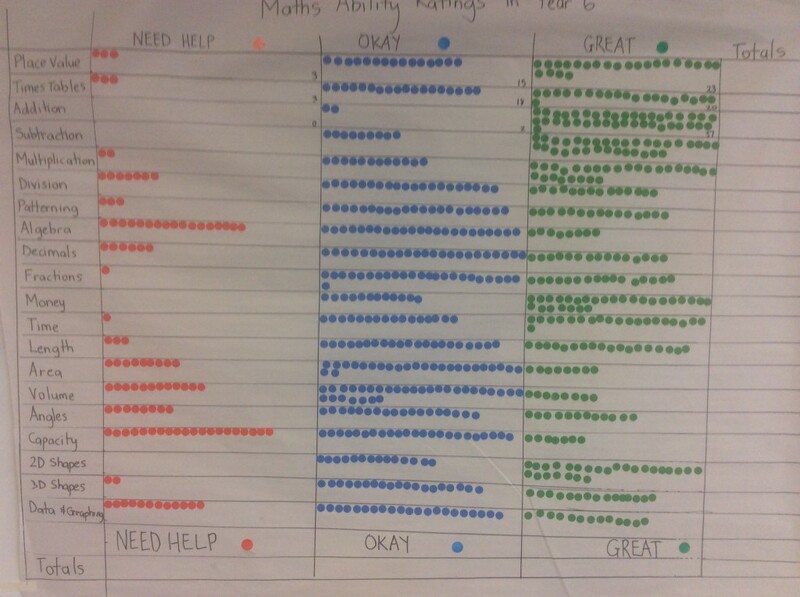 We have one summative Maths assessment per term and base some of our results on testing and general maths tasks in bookwork, on iPads and through observations. I liked the idea of introducing Maths Journals, which is something we can do quite easily using the iPad in the 1:1 program currently running in Year 6. Prompt reflections in Mathematics. (Links to IB: Reflective & Thinkers). Write a procedure on how to draw a graph. If you had to explain how to draw a graph to Year 1 students what would you tell them? Test, draw conclusions and reflect. If you need help, follow the procedures to get it. What do we mean by numeracy and mathematics? Numeracy is the practical use of mathematics in context. How can we develop estimation skills? Handful Grab Game. Estimate and counting games. Refer to MLATS booklet. Mental Computation: Do this every so often but make sure to go through the processes afterwards. This is important for developing quick thinking strategies as well as going over different strategies each student has used and trying them in the next mental computation quiz. 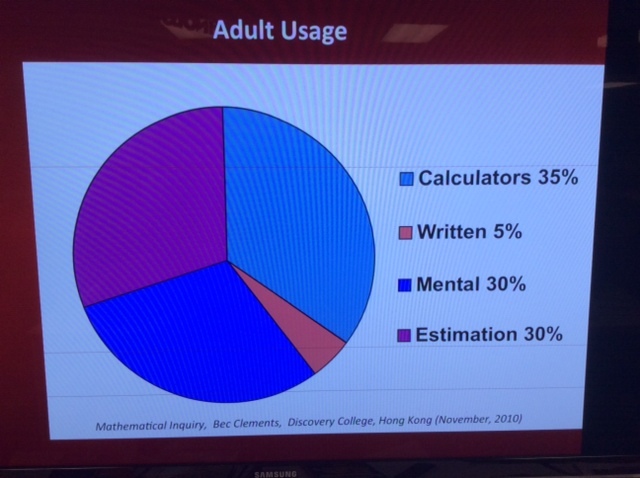 I found this image about Adult usage quite interesting but not shocking. We as adults use calculators, estimation and mental computation strategies before written strategies. Yet we are getting our students to record and write their Mathematical thinking in their books all of the time. We need to create a balance here and make sure that we are giving students the opportunity to estimate, use calculators and solve mental problems. I always like to set myself a few goals after a workshop and at least attempt one or two of them within that week. 1. 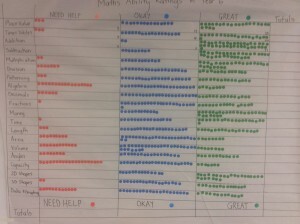 Year level Maths Survey and Data Collection task. How are our students feeling about Mathematics? How do they prefer to learn? Ability Ranking data. 2. Maths Journals/ Reflections after the lesson. This won’t simply be a separate book but at the end of the lesson allow for reflection in their maths book or on their iPad. 3. Mental warm up strategies as per my PLP Goal (See Heather for demonstration lesson asap). Go through the mental guides in the MLATS booklet. The Van de Walle Professional Mathematics Series. Open Ended Maths Activities: Using good questions to enhance learning in Mathematics. 2nd Edition. Peter Sullivan and Pat Liburn. For the last two years my team and I have been developing a Middle Years Programme (MYP) unit of inquiry in Language & Literature based on the novel and film “Follow the Rabbit Proof Fence” by Doris Pilkington and directed by Phillip Noyce. I was introduced to this inquiry unit by my colleague Andy Peartree (http://anderspearz.edublogs.org/) who had historically taught this unit to Year 6’s in previous years. Paul Huebl and myself enjoyed team teaching this unit in 2013, but this year I have been teaching the subject to all students across the year level on my own. Within this unit we have been exploring the MYP Statement of Inquiry: Films and novels convey the same message to an audience. We have been comparing different texts to see if the same messages can be conveyed. I have used the film and novel, “Follow the Rabbit Proof Fence” and the picture book, “The Rabbits” by John Marsden and Shaun Tan, to see if the theme and messages about the Stolen Generations were conveyed similarly and which medium was the most powerful. 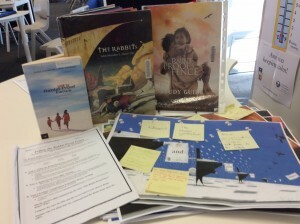 My students are now in the process of analysing the film, doing guided reading sessions and making text connections with “The Rabbits” by John Marsden and Shaun Tan. Did the novel or film communicate the story “The Rabbit Proof Fence” better? Why? Compare the ways the film and the novel explore your chosen theme. Explain why you think that one communicated the theme better than the other. This is the first essay my Year 6 students have written so quite a bit of scaffolding has been required. I’m looking forward to reading their completed responses and final reflections about the inquiry statement after this assignment. In 2014 my year level (three Year 6 classes) will embark on a 1:1 iPad program. Many of my blog posts in 2014 will be based on my research and iPad practices in the classroom. Why Technology? Why the iPad? It was early in my teaching career that I realised the value and importance of using technology in teaching and learning. Early in my career, my classes were limited to a few desktop computers and we would allocate time for students to use the technology available. We would also book cameras, video recorders, tripods and so on to assist us with recording our learning and creating pieces of work. Then we were sourced with a class set of laptops, which we could borrow and use for certain lessons. This was a game changer back then, as the laptops were portable, there was 1:1 accessibility, they had cameras in them and video recording programs and we had the opportunity to cater for individualised learning. Collaboration across the class when creating projects with technology becomes easier and we also have the world at our fingertips. Technology is simply a tool, which allows access to greater resources, whether those resources are the Internet, students and teachers across the world or sharing amongst peers. Technology allows opportunities to learn from others and share our learning in an instant way, something that we couldn’t have achieved at this standard before. We hear the term “21st century teaching and learning” frequently, and as an educator I question what this really means and what that looks like in the modern classroom. The iPad has been described as a revolutionary tool in education for quite some time, but why? What are the main differences between an iPad and a laptop for example? Firstly, we cannot deny the iPad’s portability and mobility. The idea of anytime and anywhere access to information is a game changer, this device can be used throughout the school day and easily transported home to be used as a continuation of learning and creating at home. Why should learning be limited to just the classroom? We use personal devices, like phones, ipads or laptops, to assist us with day-to-day organization and workload. Shouldn’t we be preparing our children for a world where technology assists managing life’s tasks? The iPad is sensory, intuitive and relatable to our students today. It’s a tool that allows for student creativity, collaboration and problem solving. A tool, which assists in, individualized education, meeting the needs of the individual. 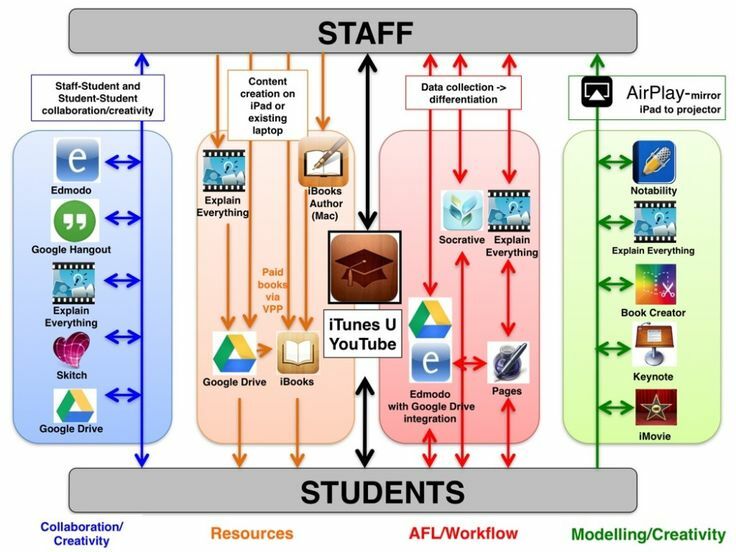 I found this image on Twitter about iPad workflow and thought it would be a useful resource for myself. 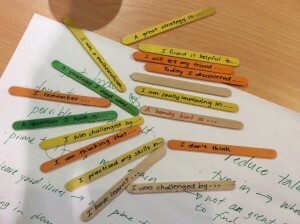 As part of my school’s development of school vision, staff have been dedicating time to explore their personal pedagogy. This has been done through our IDEAS program to assist staff in developing a Professional Portfolio to benefit school direction. 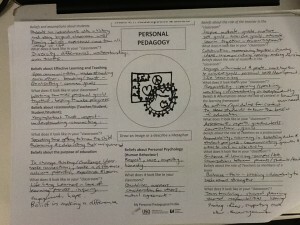 How do my personal talents and gifts shape my pedagogy? What counts as a specialist ‘knowledge’ in my work? What is my personal pedagogical philosophy? 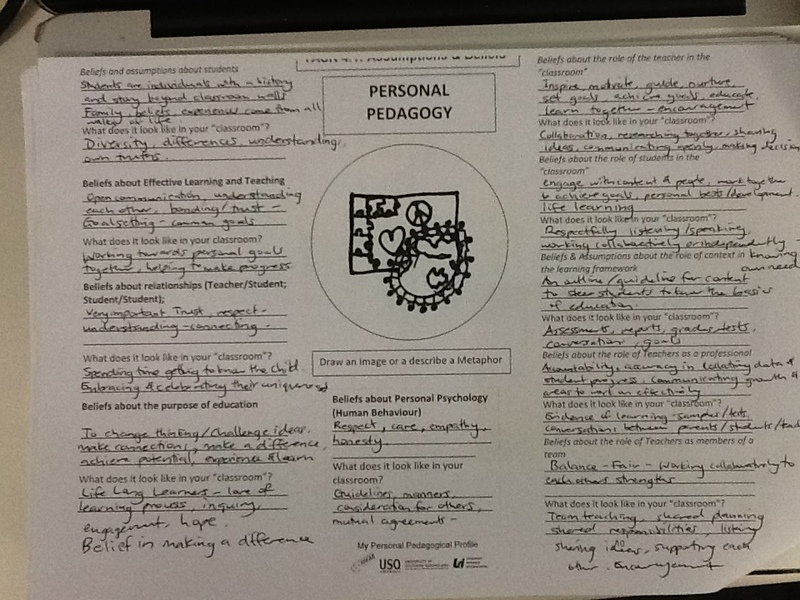 We were asked to participate in four tasks to assist us in discovering and refining our personal pedagogy. This post will explain each of the tasks undertaken personally and my professional stance on my personal pedagogy. Task 1: My Motivation for Teaching. Teaching for me has always been about developing relationships and bonds between students, families, staff and teachers. Once relationships are built we can work together to achieve common goals. Teaching and learning involves making connections with individuals to assist them with their personal development. I believe in the development of the whole child, not just the ability to meet curriculum outcomes. As an educator I am passionate about realising the potential and strengths of each child to assist them in achieving their goals. I believe in valuing the individual and helping them to contribute to our world in their own positive ways. The process of learning opens the world and mind. We are all on a learning journey and as a teacher I love to inspire, motivate, navigate and join in on the journey of lifelong learning. I have been teaching in primary schools for ten years. During this time I have taught across all year levels. 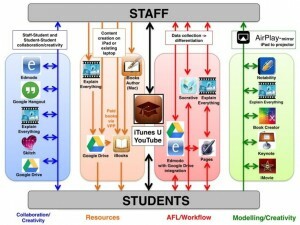 I am a R-7 teacher and an Apple Distinguished Educator. I am currently working at an independent school, teaching Year 6 students. I am continuously working towards developing my knowledge and understanding of the International Baccalaureate program in order to assist me with my teaching strategies. I have been working in the MYP( Middle Years Programme) for the past two years. In particular I have been developing my MYP planning skills and exploring the possibility of taking on specialty subjects across my year level. At this stage I would like to specialise in Humanities, Language A and Personal Development. I have been encouraged to explore the MYP further, attend more professional development and take in as much as possible, whilst also making sure that I am meeting the National Curriculum standards. During our IDEAS session we were asked to reflect on an event that changed the way we teach. In the last three years I have been working in an Independent School, previously I worked in public education. This change of workplace has had profound effects on my teaching and learning. I went from working in a low socio-economic school with underprivileged students, with challenging behavioural and learning needs (full classes of 30 students) to a highly accomplished school with privileged students varying in academic abilities (Average class size of 20 students). This had huge ramifications on my teaching practice. I have had more time to focus on my teaching skills as opposed to my behavioural management strategies. I have also been able to cater for individualised learning, smaller class sizes have allowed more time to refine my strategies to cater for differentiation within my class. I have identified that there are similarities between my students from both schools. Every child is an individual who requires guidance on their learning journey, in particular their social and emotional development. I believe that social and emotional well-being is of significant importance within education. Developing students ability to be resilient, confident, organised, persistent and get along with others (You Can Do It Education. The Five Keys of Success: http://www.youcandoiteducation.com/whatis.html) is of great importance within all areas of learning. I have been teaching using the YCDI Programme for the last 5 years and have noted that the majority of my students have made academic improvements as a result of developing themselves in these areas. Using the positive habits of mind and developing self-confidence, setting personal goals and aiming to achieve them. It is due to my experience within this area of teaching and learning that I have developed a keen interest in studying counselling, to understand and assist my students with their development. I am considering studying part time in the near future to further my qualifications within this field. Part of the IDEAS staff task was to use the Myers Briggs model to identify our personality profile. I formally completed the Myers Briggs test in 2010 and was identified as an ENFJ. After our IDEAS session I still identified with the ENFJ preferences. This is what the letters stand for and how I identify with them. This means I focus on the outer world of people and things. I am energised by what goes on in the world and I prefer to communicate more by talking than writing. I need experiences in the world in order to help me to understand it. This means I look for meanings, relationships and possibilities that go beyond the information from the senses. I look at the big picture and try to grasp overall patterns. I am an expert at seeing new possibilities and I value imagination and experiences. I make decisions based on person-centred values. When making decisions I consider how important the choices are to myself and others. When conversing with others, I tend to become sympathetic, appreciative and tactful. I value harmony and work hard to ensure my environment is harmonious. This means that I prefer to live in a planned and orderly way. I endeavour to regulate and control my life by making sensible decisions, setting up routines and structures, being organised and settling or resolving issues when they arise. Learning lessons through experiences- hands on learning, real life lessons, relevant and engaging content where students experience and participate. Building relationships and developing students personally, especially in regards to their social & emotional well-being. Balanced- organisation, planning, structure, predictability and routines which lead to consistency. Task 4: My Assumptions, Beliefs, Philosophies that inform my practice. Type C: Comprehensive Education- general education for life. People: Aristotle, Socrates, Plato & Piaget. Type P: Progressive Education- education for problem solving in society. People: Dewey, Sizer & Spady. Type S: Social Change Education- education for transforming society. People: Freire & Illich. Type H: Humanistic Education- education for self actualisation. People: Carl Rogers, Maslow & Montessori. My dominant philosophy of teaching lies within Type H, however I have strong identifications with Type S too. Students learn in a variety of different ways and as a teacher, I plan to meet individual needs. I am willing to learn new practices and teaching methodologies to assist my students with their learning goals. To ensure I cater for the diversity within a classroom, I plan and program individual student learning goals to allow for differentiation. 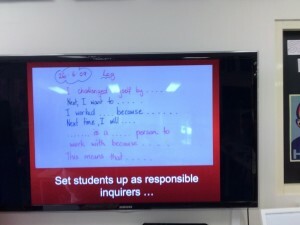 I work with students to set their own learning goals as well. I believe students should be aware of their personal achievements at school and also have input to what they want to learn about. 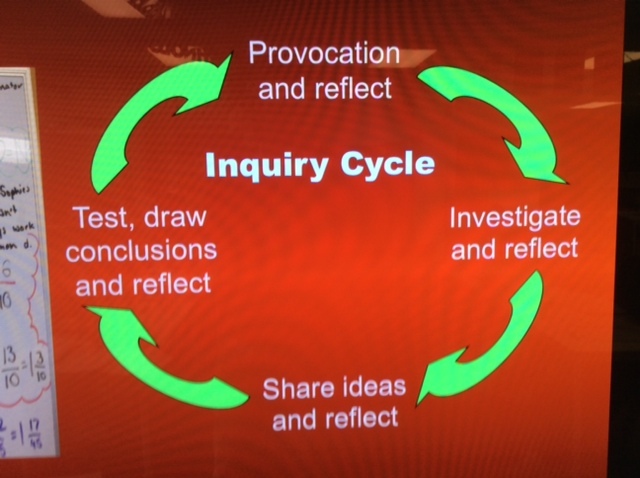 I am keen to use structured and purposeful inquiry methods to teach students how to be life long learners to make relevant connections with our world. I believe it is important to know where students are beginning in their learning journey in order to assist them with where they need to go. Therefore, frequent assessment and testing is critical in a child’s development. It is vital to keep this data to measure student successes and to build upon those successes. My assessments enhance accurate reporting to parents and fulfil my teaching duties and accountability. It is my duty within the classroom and school setting to provide a stable and friendly learning environment for my students. A nurturing and collaborative classroom environment will enhance student learning opportunities. I want my students to experience their own learning journey with some direction and guidance from myself to keep them on track with their learning goals and to extend them further. I want to be the facilitator of learning but also learn from my students. They have a world of knowledge and understanding from their own experiences in life. We are life long learners in a connected world. Most of all I want student learning to be relevant, fun, engaging and purposeful. We never know what kind of world our students will be living in in the future, so developing life skills such as problem solving, creativity, ingenuity, cooperation, collaboration, risk taking, inquiring and effective communication can play an integral role in the development of a child for success in their adulthood. Please leave me some feedback, I’m new to blogging and appreciate constructive criticism. Always craving to learn from others, please retweet me to educational professionals.